In a couple of months I will move into a new apartment and with this comes a new underground room and a new garage that I want to connect to the apartment. Wifi is not really an option in this environment due to the relative positioning of the spaces and I decided to give another try at homeplug. In the past I had a base HomeplugAV and the performance was a disappointment. Better than wi-fi in the specific location that I needed to reach (where wifi signal was nonexistent) and useable for light internet navigation, but not an acceptable transmission layer to do a backup. This time I went for the latest and greatest incarnation of the standard to get another disappointment. Hope: 350Mbit/s reported by the monitoring tool in the garage and 186MBit/s in the underground room. It is much faster than the earlier HomeplugAV, but the marketing-reality gap is still embarrassing. The product is clearly geared toward IT-illiterates: the monitoring tool is extremely limited. Sometime the tool goes nuts completely: it claimed that the local adapter was not connected while at the same time a file transfer was happily ongoing. The price for the TP Link PA8030P kit is not popular at the moment, but you get 3 gigabit ethernet ports that in many cases removes the need for an additional switch and a leading edge technology. Should I find a way to bring an ethernet cable from the apartment I’ll quickly dump (again) homeplug, but until then it is better than nothing, better than wi-fi in the specific location and better than the older versions of the standard. Should you have to use your electrical wiring for data then go for AV2 with MIMO: the saving obtained by using the older versions quickly vanishes once you start experiencing the even lower performance associated with the earlier version. I’ve reported earlier that my DS411Slim started to have critical overheating problems and that I did replace the 3 years old system fan without success. In this second fix attempt I purchased a thermal adhesive from Akasa and using a filer I adapted a heat sink that I had hanging around so that it would fit with the bolts that keep the heat spreader attached to the electronic board. High hopes as before, but the file compression test failed again. The interface is working and the heat sink gets very hot. Unfortunately it seems that the more heat I remove from the CPU the more gets generated. Indexing videos generated the very same behavior. I’m running out of ideas and I’m starting to challenge the idea of getting a DS414Slim to make a fail-resistant setup. I see no point in investing in another Synology as the first one is constantly failing. It is too bad because the management software is very nice and powerful. Anyone that has an idea on what to try next is welcome to comment to this post. Below are a few snapshot of the hack. 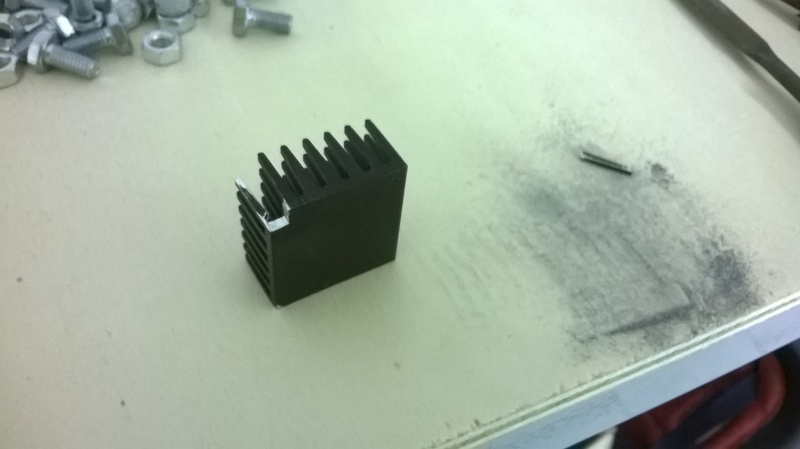 Factory fit heat spreader with connecting bolts that require heat sink adaptation. Side view with the 3 drives in place before the insertion of the empty disk frame. I’ve reported a problem with my nas a few weeks ago (here) and my plan to get it back to productive work in a reliable way. As part of this plan I did order a OEM replacement fan: searching an equivalent model with the same small connector proved to be a waste of time. 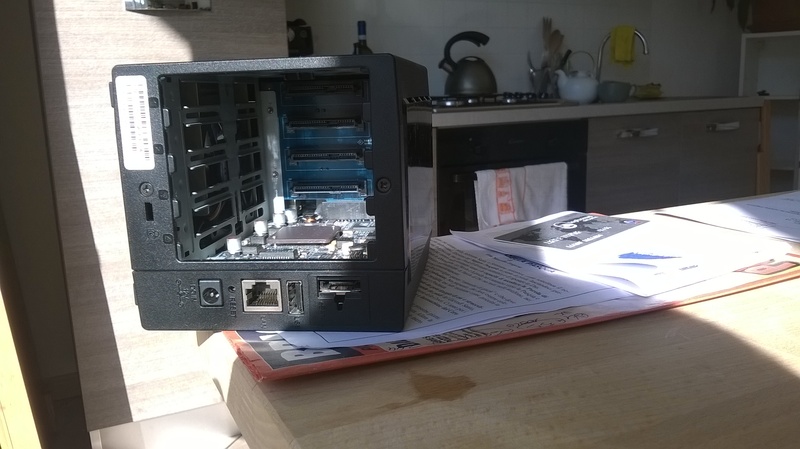 After a few weeks it finally arrived and yesterday I picked it up at the shop and replaced it in the NAS. The old fan had some substantial play in the axial direction and at low-speed failed to spin up, for this reason I had high hopes with the replacement. It was a quick job requiring only 15 minutes and then I was ready to use the NAS. Mirror rebuild worked fine, compressing a file with the PC CPU with source and destination on the NAS worked fine. Active disks were at 43C and the CPU at 48C during the rebuild; a few minutes after it was completed the disks were down to 35C and the CPU at 43C. With 19C of ambient temperature this is not an extraordinary achievement, but are manageable temperatures. I felt confident, even if not overly confident, that the fix was going to work as desired. To be sure that this was really the case and that the overheating was not going to hit me unexpected in the future I did a heat torture test by compressing a 140GB file using the NAS CPU instead of the PC CPU. This time unfortunately the NAS did behave as with the older fan: after some time it died on me. The latest reported CPU temperature in the web interface was 54C and it survived long enough to put a warning in the web interface telling me that it could not compress the file. The NAS couldn’t be reached anymore (no web interface, no ping, no Synology assistant) and couldn’t even be restarted using the power button. Next step will be to mount a heat sink on the current nonremovable stock heatspreader. 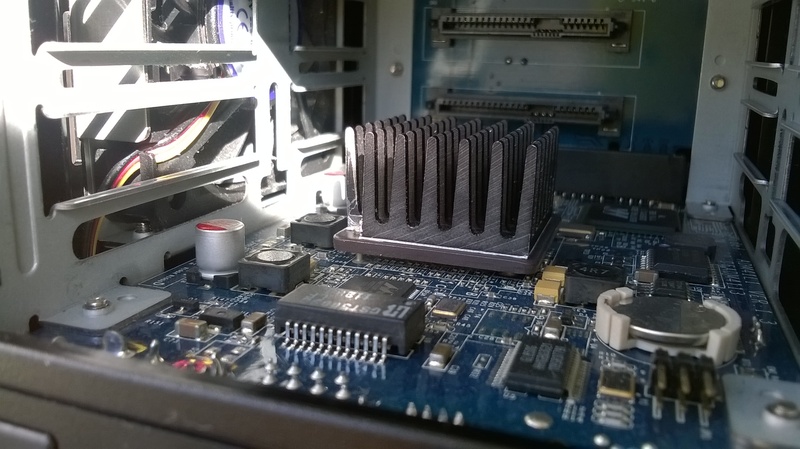 I have already found a suitable heat sink, now the challenge is to find the needed adhesive thermal pad. I will lose the ability to use the 4th disk slot, but it is acceptable because future space expansions will likely come via a DS414slim for additional redundancy and performance. And I still have the LS220D that can maintain some of the lower value data. At the end of 2014 my Synology DS411slim decided to abandon me and a couple of weeks ago I have purchased this nas to store the data in the Synology until I could put some more thinking into an appropriate fix/hack/replacement. I expected that the LS220 would be no match for the higher end brands in the SOHO area, but still I couldn’t help the first thought: cheap plastic. Once it is filled with the two disks it feels a bit better thanks to the extra weight and reduced flex that they warrant to the device. The setup was fairly smooth even if the quick startup guide could be better and the UI was all but exciting. The same feeling as before: cheap. In the end all I need in the short run is a SMB share to copy as much data as possible from the DS411Slim while it works before overheating. For this basic use I consider the device as a good fit for a very convenient price, but then comes in the performance in my environment. The best sustained writing rate I could get so far is 28MB/s on a cabled 1Gbit link while using disk2vhd to backup my notebook (98GB in about 57 minutes). Compared to the 37-40MB/s that I was getting on the 4 years old DS411Slim (see this old post about encrypted vs. unencrypted writing speed I was experiencing) this is not a good number for this workload and makes the LS220D less suitable for one of my key use cases. 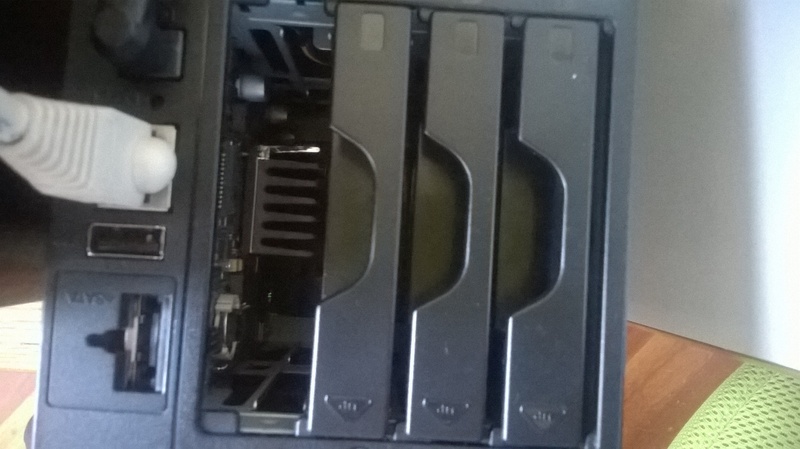 To conclude: if you have a pair of spare 3.5″ drives in a drawer the LS220D is an expensive way (I paid mine 69.99€) to put them to work for the benefit of the entire house. If you are planning to purchase the drives for the purpose of putting together a NAS you should really shop for a higher class NAS than the LS220D. 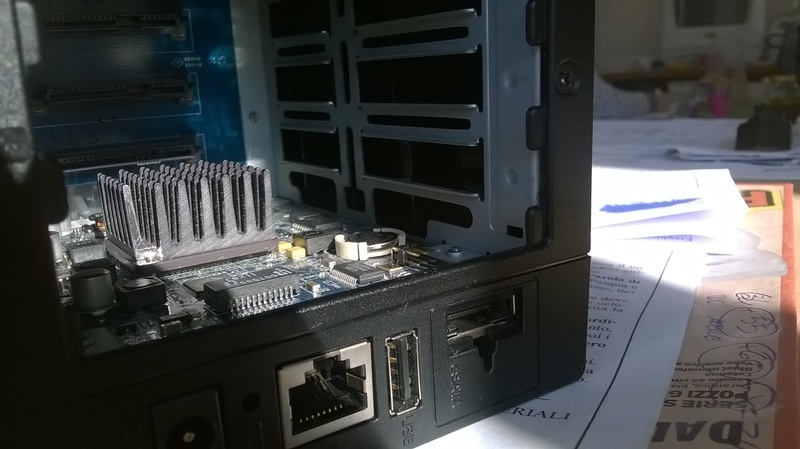 It was a while that I was traveling quite a bit and giving little attention to my home NAS. It was getting stuck from time to time but I was not really worried. For Christmas I had some spare time and decided to do some much-needed backup: the notebook to the NAS and then the NAS to a USB disk that I usually keep disconnected to be on the safe side. Things did not work out as planned because the DS411Slim was not running long enough for me to complete even the first step. Status led a solid blue, network led blinking, but no data movement at all and it will not shutdown using the physical button. Only way to restart the NAS was plugging the power and as you know this is not the nicest thing to do to a disk with data being written to it. I did it one time too many and got the status led blinking nonstop. One of the disk’s metadata was corrupted and the mirror diskgroup in degraded state. Situation was bad but not tragic: I decided to reverse the order of activities and do the NAS backup first using the disk still working. Then I decided to hack the fan control file to make the fan spin faster as suggested in and then did the notebook backup using from Microsoft. I felt all my problems were fixed, but I was soon proved wrong. Due to the scarcity of space on the share I decided to let the NAS compress the .vhd file by issuing the command through the web file manager and I got hit by the CPU overheat issue again even if the fan was clearly spinning (relatively) fast. I did another try at the compression after restarting the NAS and it went down again: cpu in the web interface appeared to be in the 52-53 celsius last time I checked before going to sleep, but in the morning the system was stuck again. I have almost alternatives: I have to mod the device. One option is to replace the fan: maybe it just got tired after a few years and can’t spin as fast as it should. 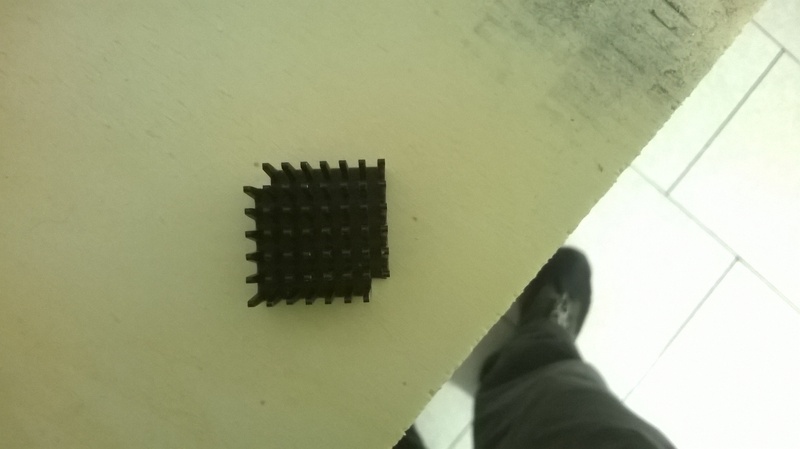 Another option is to use a thermal adhesive to attach a finned heat sink to the CPU: the heat spreader (irreplaceable) is absolutely untouchable (I mean burning) when the system is blocked hence it can clearly benefit from a better heat dissipation. Before I go down this road I need to have a failsafe solution hence I ordered a cheap Buffalo LinkStation 220 with a pair of 1TB disks where I will copy all the content of the Synology.